Signature ingredient: Gently cleansing, nourishing lather of organic lavender moisturizes and softens the skin. Enriched with vitamin E, panthenol and arginine. 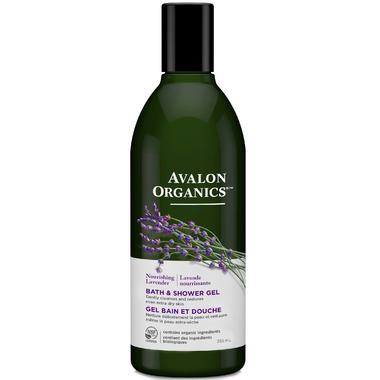 Product description: Nourishing botanicals, gentle cleansers and the soothing aroma of organically grown lavender replenish your skin and revitalize the senses. Features and benefits: Formulated with a special blend of gentle, plant-based cleansers, our certified organic herbal blend, certified organic essential oils, our signature Vitamin and Amino Acid Complex and special skin conditioners to moisturize and soften the skin. Directions for use: Apply to damp skin in bath or shower and gently massage into moisturizing lather and rinse clean. For a luxurious bath soak, pour 1/2 ounce under running water. Lavender sent is subtle but rich and my skin feels wonderful, not just immediately after a shower but continuously between showers as well. I have this product in our guest shower as well and get rave reviews from all the guests who use it. Great product, good price. This smells great and it's not overpowering. I think I like the peppermint one a bit more, just because the "cool" feeling wakes me up in the morning. Love this product and the smell is incredible! One of my favorites since years! Love the fragrance and easy to rinse ! Lovely to use and the scent is wonderful. Relaxing.